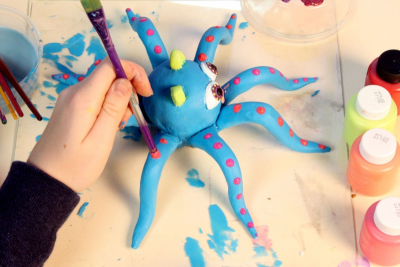 Students learn about Mexican alebrije folk art sculptures and use air dry clay and acrylic paint to create their own fantastical animal. 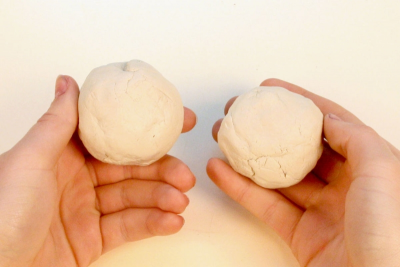 Make 2 small balls of clay about the size of a clementine orange. 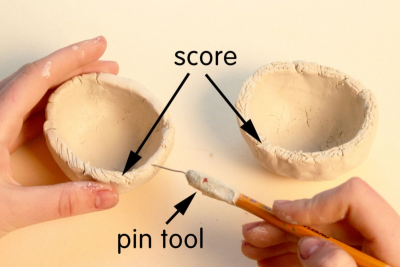 Score the rims of the pots using a pin tool. - Make a pin tool by taping an open paperclip to the end of a pencil. Brush slip onto the rims of both pots. 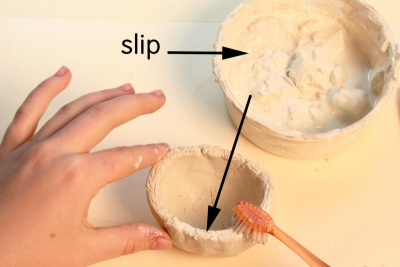 - Make slip by mixing some clay with water until it is the thickness of a creamy milkshake. 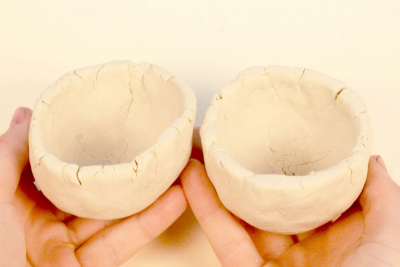 Hold one pinch pot in each hand. Join the rims together with a slight twisting motion. 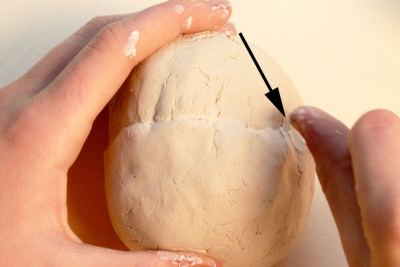 Use your thumbnail to scrape the clay from one pot to the other over the joint. Smooth the surface with your fingers. If the clay seems a bit dry, try adding a tiny amount of slip on the tips of your fingers and work it into the surface. 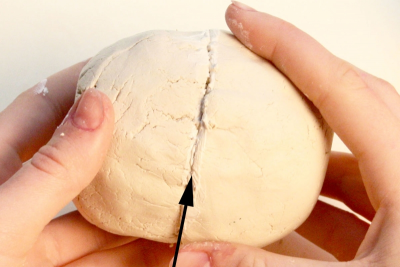 Use score and slip technique to join pieces of clay to the spheroid. 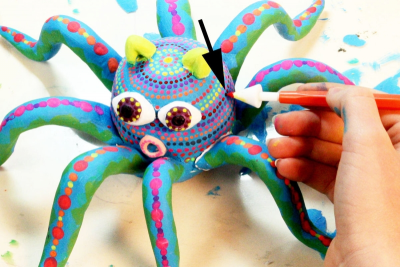 Carefully add details to make your animal fantastical. Allow the animal to dry for about 1 week. Place a plastic bag loosely over the animal to slow the drying down for the first 2 days. 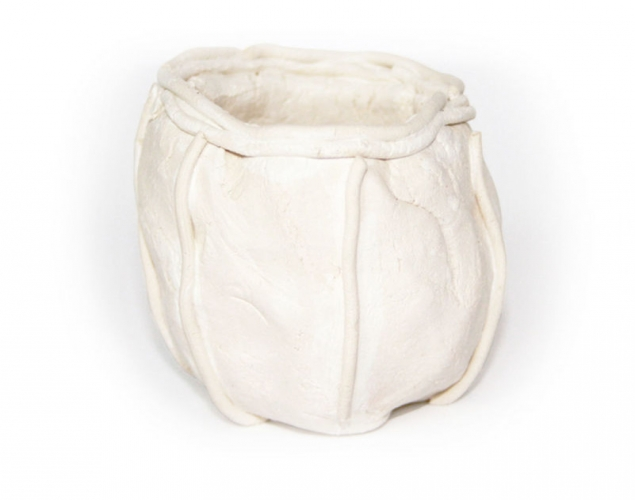 - This will help prevent the thinner pieces of clay from drying too quickly and breaking away from the rest of the animal. Once the animal is completely dry, use acrylic and neon paints to paint it. Remember to cover the animal with lots of bright patterns. Use both ends of the brush to make different marks. - The neon paint may need several coats depending on the colour. Try using the point of a pencil or cake decorating tool to make small dots. Work in teams to create a step by step How To video for clay handbuilding techniques. Create a brochure to highlight alebrije folk art and what it means to Mexico. Make a batch of slip, enough for groups of students to share. Have students make pin tools by taping an open paper clip to the end of a pencil. Gather, and make available, books about alebrijes and Mexico, for example, Coco: Miguel and the Amazing Alebrijes, by Disney Book Group; Alebrijes Mexican folk art colouring book - Fantastic & strange Creatures: The Magical World of Alebrijes, by Jorge Lulic; Oaxacan Woodcarving: The Magic in the Trees, by Shepard Barbash, and‎ Vicki Ragan; and Oaxaca: The Spirit of Mexico, by Matthew Jaffe, and‎ Judith Cooper Haden. Teach/review the descriptive writing form. Invite students to visualize their own fantastical animal based on their descriptive story. Write a descriptive story about a fantastical animal. 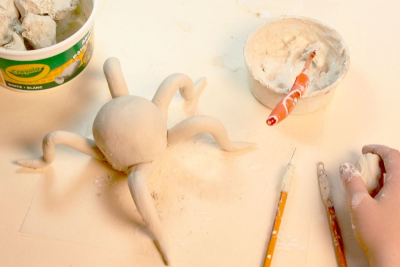 Create a clay animal based on your story. 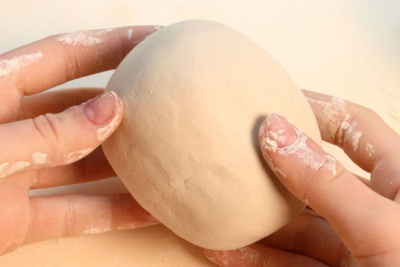 Demonstrate skillful pinch pot handbuilding techniques. 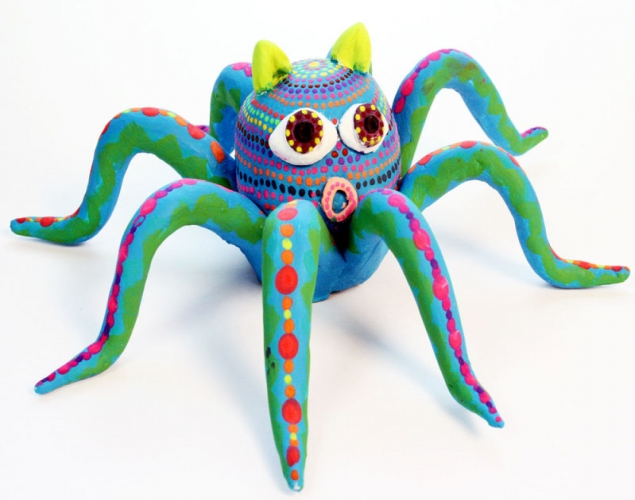 Use contrasting colours and pattern in the style of Mexican alebrijes. Encourage students to always join clay using the score and slip technique. Place students in groups of about 6. Ask them to view the animals and to share thoughts about the works. - Design - How does the design make you feel about the personality of the animal? - Colour - How does the colour add to the energy of the animal? - Pattern – How does pattern add to the overall effect of the design? - Technical Accomplishment - How does attention to detail contribute to technical accomplishment? Ask volunteers to share some ideas with the whole class. Observe students as they share and discuss their animals – active listening, insightful contributions, supporting ideas with evidence found in the artwork and from personal experience.